Range: Newfoundland, Labrador, and northern Quebec, south to the alpine summits of northern New England and northern New York. Aids to Identification: Blueberries are well known shrubs with alternate, simple leaves, white, urceolate (urn-shaped) flowers and sweet berry fruits. 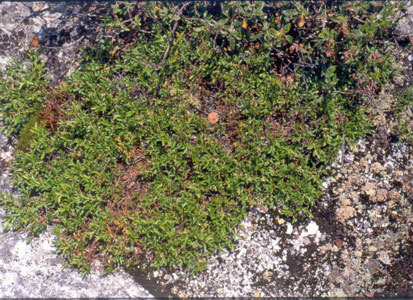 Vaccinium boreale is a dimunitive blueberry of exposed environments. 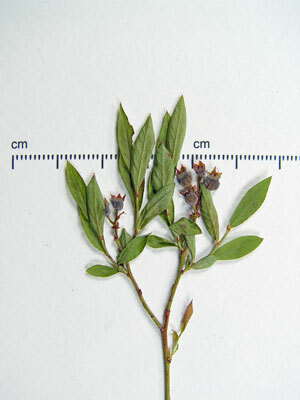 It occurs with, and looks very similar to, the common V. angustifolium, lowbush blueberry, at all known sites in Maine. V. boreale is a short (up tp 9 cm tall), shrub with very narrow (2-6 mm wide) leaves. V. angustifolium is either taller or with wider leaves, or both. Additionally, the flowers of V. boreale are smaller (corolla is 3-4 mm long) and appear 10-20 days earlier than the flowers of V. angustifolium (corolla is 4-8 mm long). 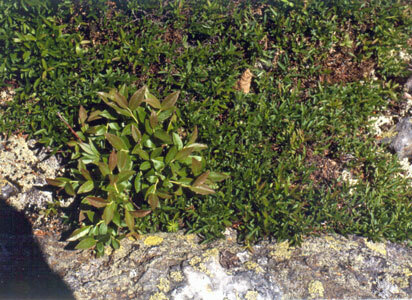 Ecological characteristics:Often found growing in cracks in rocks in alpine environments, often with other Vaccinium species. Phenology: Flowers June - July. Synonyms: Formerly considered a variety of Vaccinium angustifolium Ait. ; now known to be chromosomally and morphologically distinct. Synonyms include Vaccinium pensylvanicum Lam. var. angustifolium (Ait.) Gray; Vaccinium pensylvanicum Lam. var. alpinum Wood. Known Distribution in Maine: This rare plant has been documented from a total of 12 town(s) in the following county(ies): Franklin, Hancock, Oxford, Piscataquis, Somerset, Washington. Reason(s) for rarity: At southern limit of range; habitat is naturally scarce. This plant is uncommon, but not as rare as previously believed. Conservation considerations: At some locations, small populations could be threatened by heavy hiker or tourist use.